Classic mayonnaise and mustard, made with all natural ingredients, are blended with freshly grated wasabi grown in spring water on our Dorset and Hamshire farms to deliver the rich, floral and pungent flavour of real wasabi. Yuzu is a famously flavourful Japanese citrus fruit, the original flavour is like all citrus rolled into one yet resolutely original. Yuzu combines spectaculary well with classic mayonnaise and mild mustard to enjoy with fish, sandwiches, salads and canapés. Wasabi mayo: Wonderfully moreish and versatile, this is the only mayonnaise in the world made with English wasabi. Serve with smoked salmon canapés, spread liberally on your favourite sandwich or liven up a potato salad. 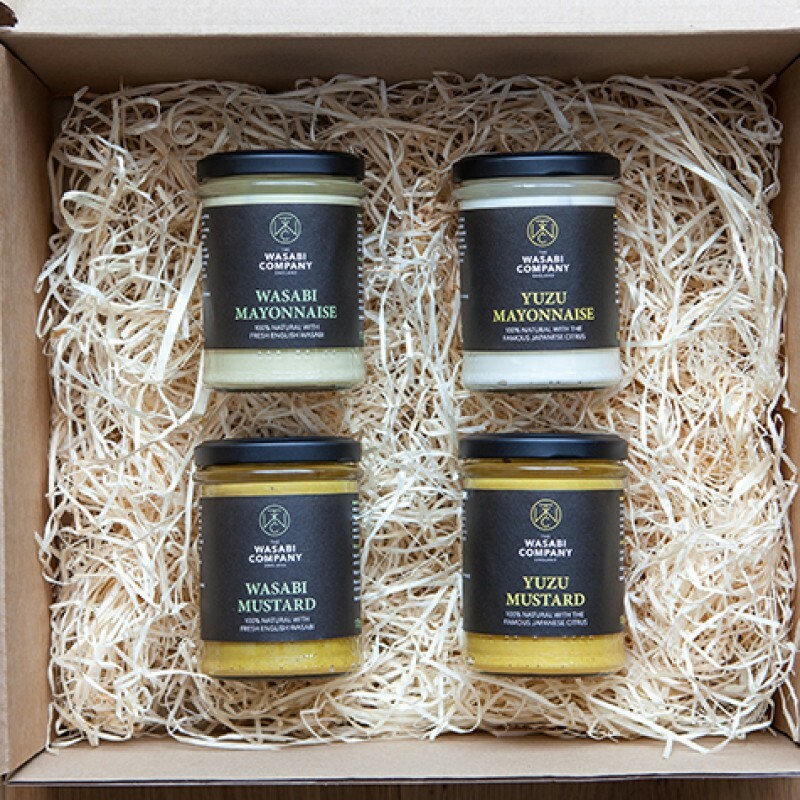 Wasabi mustard: An original, all natural mustard recipe specifically created to combine with the authentic flavour of fresh wasabi grown on our Dorset and Hampshire farms. Delicious in ham sandwiches, with beef, patê or cheese. Use in salad dressings and sauces for an orginal flavour with the unmistakable, aromatic pungency of fresh wasabi. Yuzu mayo: The aromatic and tart flavour of fresh yuzu, with notes of lemon, mandarin and grapefruit, combines exceptionally well with our all natural mayonnaise. An excellent topping to salmon or crab canapés, yuzu mayo also makes an original, zesty dip and is delicious with avocado toast. Yuzu mustard: The unique, tart flavour of fresh yuzu combining lemon, mandarin and grapefruit balances exceptionally well with this mild mustard. Enjoy with cheese, fish or white meats. Add to sauces and dressings for an original burst of citrus that is both surprising and moreish.